Veterans of the 1399th Engineer Construction Battalion; 100th Infantry Battalion; 442nd Regimental Combat Team; Military Intelligence Service; and all other AJA World War II male/female veterans assigned to military unit(s) outside of the previously identified units. Honor and perpetuate the AJA World War II Veteran’s legacy and request a one-time “gratuitous” replacement of his/her authorized military awards and decorations through the National Personnel Records Center (NPRC), and the Awards and Decorations Branch (ADB), US Army Human Resources Command (USAHRC). Jeff Morita, a retired US Army Sergeant First Class and GG-13, Department of the Army Civilian and member of the Sons & Daughters is pleased to offer his public service assistance for this not widely known “FREE” benefit program. The two (2) separate, yet loosely interlinked request programs are available to surviving veterans, or posthumously to their primary next-of-kin (NOK). 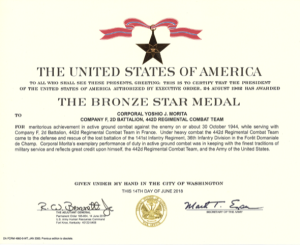 US Army regulatory policy governing the military awards and decorations program is very explicit with regard to NOK eligibility and issuance of awards and decorations. 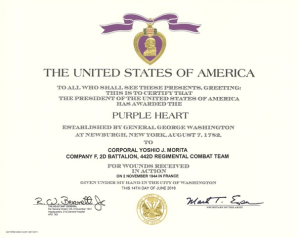 Posthumous awards are issued only to the service member’s primary NOK starting sequentially with the surviving (but not remarried) spouse, eldest child, father or mother, eldest brother or sister, or eldest grandchild. * World War II veterans awarded the CIB or CMB are eligible to receive a BSM for World War II Service. Not many veterans, or their primary NOK, are aware of this policy extended only to eligible World War II veterans. 1) The initial NPRC request will engrave the full name of the veteran on the reverse of each verified DSC, SSM, LOM, BSM, PHM, or AGCM service medal. 2) The follow-on ADB, USAHRC request is separate from the NPRC request for “all other awards and decorations not sent by NPRC”. This includes official US Army Certificate(s) for verified DSC, SSM, LOM, BSM service medals, etc., very nice for framing and display. 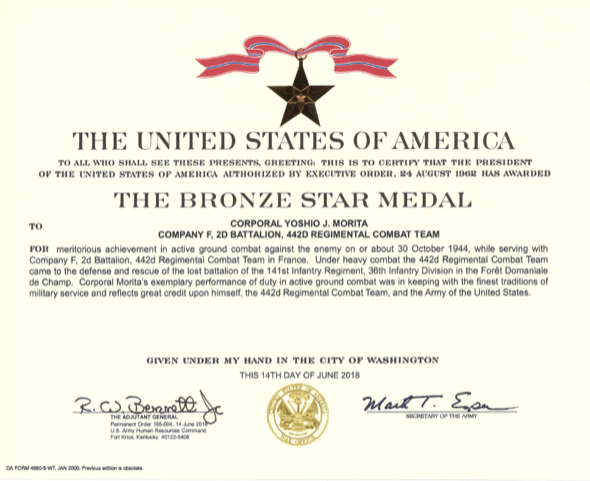 Examples of ADB, USAHRC results of Bronze Star Medal and Purple Heart Medal certificates for Corporal Yoshio James Morita, F “Fox” Company, 2nd Infantry Battalion, 442nd Regimental Combat Team (Jeff’s uncle). 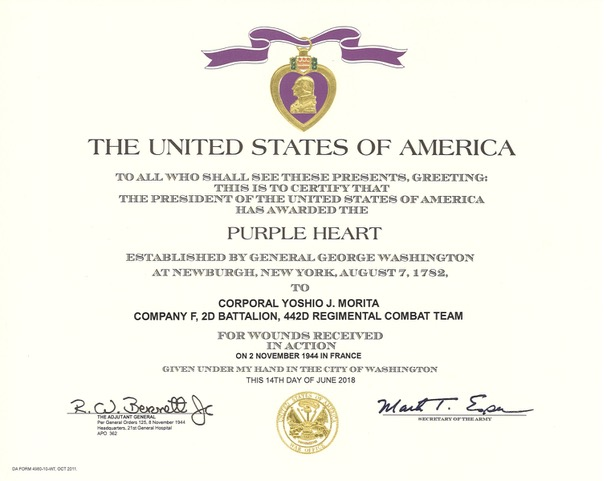 Official US Army certificates are not available through the NPRC request. This entry was posted in 442 Sons & Daughters Events-Meetings-News. Bookmark the permalink.